Adventurous reporter Tintin races to find the lost Haddock treasure against the treacherous Red Rackham. Directed by Steven Spielberg and produced by Peter Jackson. 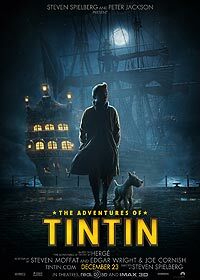 Tintin:"Bad news captain! We've only got one bullet." Captain Haddock:"And what's the good news?" Tintin:"We can't turn back. Not now. Not now." Tintin:"How's your thirst for adventure, captain?"